Chuck Malson (right) has resigned and retired as senior pastor of Brown Corners UB church (Clare, Mich.). In mid-September, Dave Luther, who has worked on staff at Brown Corners in a counseling role, began serving as senior pastor in an interim capacity. Chuck Malson had been senior pastor of Brown Corners since 1981. Only one other current pastor has served at his present church as long. Joe Cilone, pastor since 1981 of Pleasant Heights UB church (East Liverpool, Ohio), now has the longest tenure of current UB pastors. Baptismal service for Shepherd of the Valley UB church. 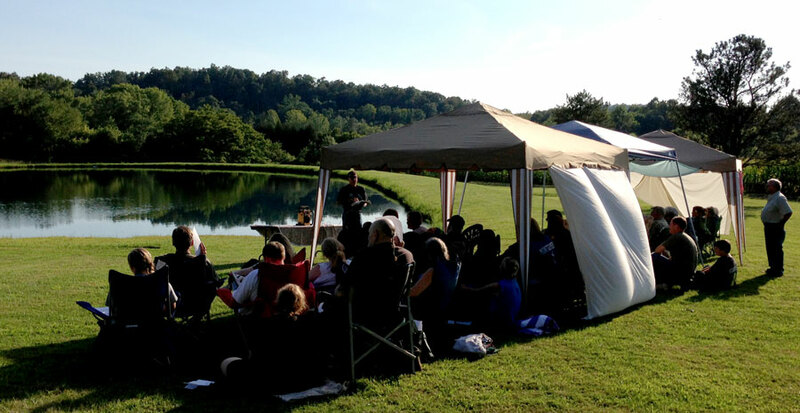 On Sunday, August 25, Shepherd of the Valley UB church (Logan, Ohio) held a baptismal service. Senior pastor Doug Stull and associate pastor Jason Sheets baptized seven persons in Carmichael pond near Sugar Grove, Ohio. Pastor Doug shared a message about the fundamentals of the Christian faith. After the service came a time of fellowship and ice cream. Delegates from Sierra Leone at the Ghana 2013 conference. L-r: Mr. Edward Jusu Jr., Mrs. Sally Conteh, Bishop John Pessima, Mr. James Abdulie. 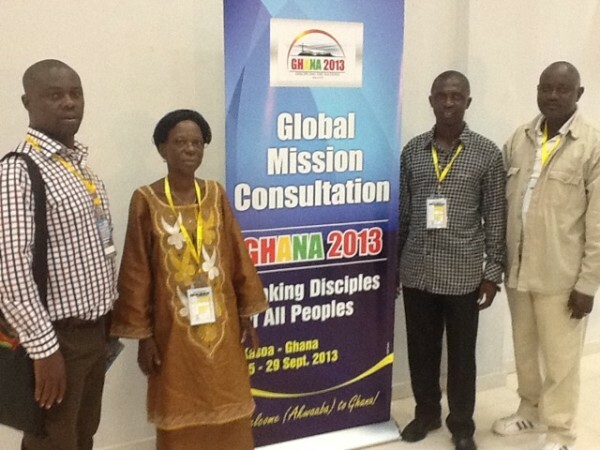 Bishop John Pessima and three other persons from Sierra Leone Conference attended Ghana 2013, a conference on disciple multiplication in Accra, Ghana. It was held September 25-28. This conference focused particularly on the African context. The first conference of this nature took place in Tokyo in 2010. Although speakers at this event were primarily from Africa, there were also speakers from Asia, Latin America, and North America. Mr. Edward Jusu Jr., the youth and young adult national coordinator. Mr. James Abdulie, national president of the Master’s Men International. Global Ministries was able to assist these four delegates using funds from the Antioch Fund. The Sierra Leoneans paid for their visas and conference registration, and the Antioch Fund paid for their flights. The fund is designated to assist our United Brethren international partners in missions and mission mobilization. If you would like to make a contribution to this fund, send your gift to Global Ministries, 302 Lake St. Huntington, IN 46750. Indicate that your gift is for the Antioch Fund. Interested in a career in ministry or missions? Huntington University will host a visit day for you on October 3. During the day, perspective students will have the opportunity to tour the campus and talk with faculty and current students. To register and to see the full schedule of the day, visit explorehuntington.com. To learn more about HU’s ministry and missions majors. Matt Kennedy has been appointed senior pastor of Dillman UB church (Warren, Ind.) effective October 21, 2013. For the past few years, Matt has served as associate pastor of Anchor Community Church (Fort Wayne, Ind.). He was granted a national conference ministerial license on March 5, 2013. Matt and Jennifer were married in January 1996, and have two children. Jennifer will step down from her part-time role as Anchor’s Ministry Coordinator on October 24. Here are five events scheduled for 2014. The links take you to further information on the UB website. January 13-14: Cluster Leader Training. This is an annual event for cluster leaders. It’ll be held in Huntington, Ind. April 28 – May 1: UB Youth Workers Summit (Holly Hill, Fla.). This is an annual event of encouragement and training for persons in youth ministry. It is available to all paid youth ministry staff or the lead youth ministry volunteer in the church. May 5-8, 2014: UB Worship Summit in Daytona Beach, Fla. This summit, designed for persons serving on staff in positions involving worship and music, is held every two years. May 12-15, 2014: Associate Staff Summit in Daytona Beach, Fla. This summit, held every two years (this is only the second one), is designed for persons in UB churches working in such staff roles as pastoral care, adult education, visitation, counseling, missions, discipleship, children’s ministry, etc. September 19-21, 2014: UB Women’s Conference at Sawmill Creek Resort (Huron, Ohio). A women’s conference is held every two years, under the sponsorship of the Women’s Ministry Leadership Team. Marvin Schwartz resigned as senior pastor of New Horizons UB church (Rockford, Ohio) effective August 24, 2013. He had pastored the church since May 2008. Don Gentry resigned as senior pastor of New Hope UB church (Camden, Mich.) effective July 15, 2013. After eight years of successful ministry at New Hope, Don and Stacy Gentry and children relocated to North Carolina to pursue opportunities there. Juanita Chavez amidst a group of praying Hondurans. 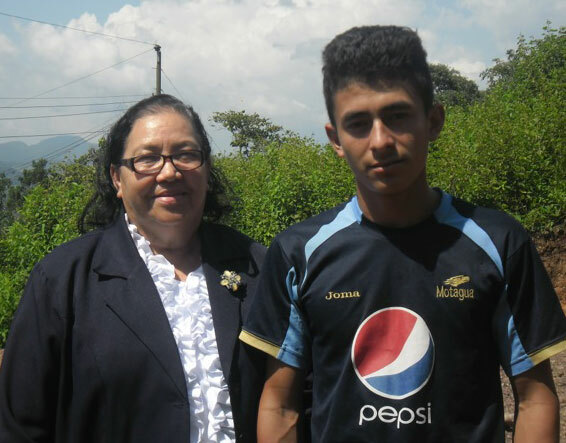 Juanita Chavez and a Honduran young man. 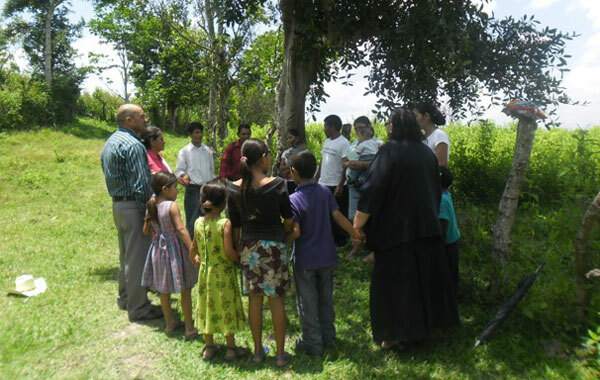 A circle of Hondurans praying in an outside location. 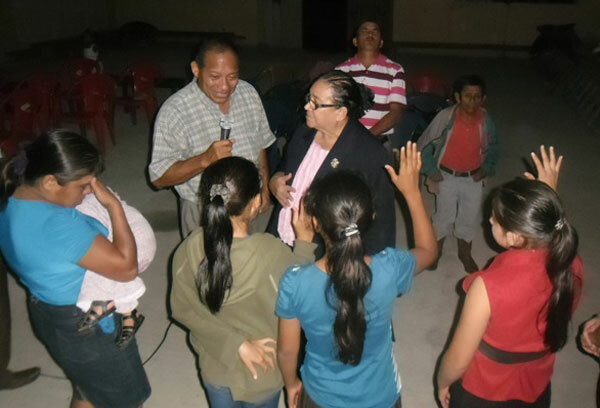 Juanita Chavez, superintendent of Honduras Conference, recently traveled through the regions of El Copan and Santa Barbara in Honduras. The intent was to bring encouragement to a number of church planters. She and her fellow workers also held a number of church-based theological classes for pastors and church leaders. During their time, they participated in a number of worship services. On one such occasion, three teenage girls decided to become followers of Jesus. They also met a 20-year-old man in a mountain village who gave a parcel of land that is part of his inheritance so that a new church could be built. Continue to pray for the work of Honduras Conference. With more than 100 churches, they have only just begun to multiply churches throughout the country. Pray, too, as they consider how God might be calling Hondurans to become engage in foreign missions. Scott Hardaway, senior pastor of Pathway UB church (Jackson, Mich.) since 2001, announced his resignation on September 22. It will take effect November 15, 2013. 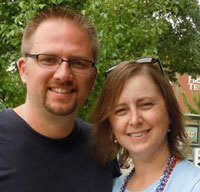 Scott’s wife, Tanya, died of cancer on October 29, 2012, leaving behind two young sons.